Have you ever run into a lot of misunderstandings about DVD video resolution? This article provides the most complete answers about questions related to DVD resolution. Let’s have a look. Although DVD has gradually faded out of people’s sight, there are still many users who have a large number of DVD collections and are used to burnig DVD for storage and backup. Recently, some users have encountered a lot of questions about DVD’s resolution while backing up and burning DVD. I’m sure many of you probably have the same questions. Thus, I have sorted out some common questions and give the corresponding answers. Q1: What is normal DVD’s resolution? I want to burn some videos on a normal DVD, and I want to know the standard DVD resolution. A1: In addition to HD DVD and Blu-ray, the standard DVD’s resolution is 720x480 pixels for NTSC and 720x576 pixels for PAL in either 4:3 or 16:9 aspect ratio. Therefore, you need to understand that the standard DVD video resolution belongs to SD (standard definition) instead of HD (high definition). Q2: Is higher DVD resolution equal to better video quality? 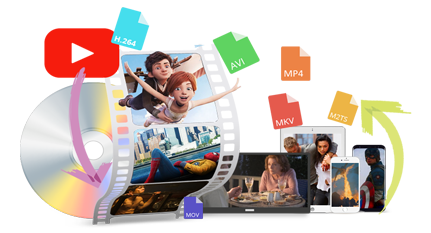 Why many people prefer to DVD’s resolution like DVD 720p or DVD 1080p? A2: This is a misunderstanding about DVD quality resolution. What really affects video quality is its video bit rate, not its resolution. If the bit rate of source video is very low, then the higher resolution will result in video quality degradation. Just imagine, a fuzzy picture, even if it is magnified many times, the final effect will get worse and worse. That is the same reason. Q3: Can I burn 720p or 1080p videos on a DVD disc? I have a Blu-ray Player, so does the video quality look better? A3: You can burn 720p or1080p videos/movies on a DVD disc. But in fact, during the burning process, the DVD burning software has automatically re-encoded the video and downscale it to the standard DVD resolution above. 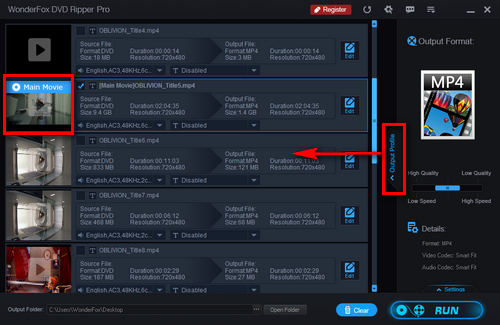 If you want a video with 1080p quality, you need to burn it with Blu-ray burner and Blu-ray Recordable (BD-R) discs. Otherwise, even if you insert DVD into the Blu-ray burner, the normal DVD won't record 1080p. WonderFox DVD Ripper Pro is a professional smart DVD ripping software that supports current DVD max resolution so you can adjust the Resolution, Encoder, Bit Rate, etc. manually. Q4: How does SD DVD content look on HDTV or 4k TV? It would be better or worse? A4: This is about DVD upscaling technology that we’ve talked in previous article. Nowadays, most DVD/Blu-ray Player and TV sets have the built-in upscaler to make your SD DVD fit the whole screen of TV. However, you should keep in mind that the DVD quality is still SD. Although it looks a little flatter and softer on HDTV and 4K TV, it can't be compared with real HD DVD or Blu-ray quality. In addition, the screen size and the distance between the TV and your seat will also affect the final viewing effect. Q5: Can I make a backup of my own standard DVDs in 720p, 1080p and even 4K standard? A5: Just like the answers above, the modern DVD/Blu-ray Player and TV sets can support DVD upscaling. So there's no need to back up and upscale DVD to 1080p or 4K. However, if you have other needs or you are still using an old-fashioned DVD Player or TV, you can make it with the following steps. WonderFox does not advocate using the following methods for any commercial purposes. Please make sure it is legal to back up DVD in your country. Before start, please free downloadfree download an acclaimed and credible DVD ripper to help you to rip DVD. Insert DVD disk into DVD drive of your PC and run WonderFox DVD Ripper Pro. 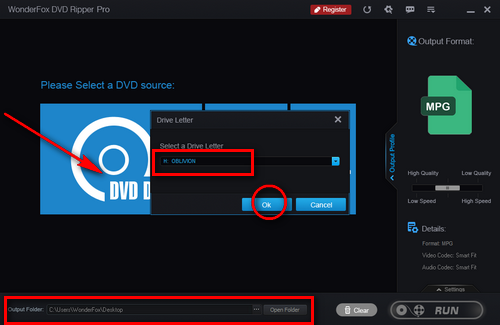 Select an output folder and click “DVD Disc” to choose the DVD you want to rip. Then click “OK” button. The program will automatically analyze, remove the DVD, copy protection and mark the main title of DVD. Besides, you can choose to add subtitles by click “T” button. Click “Output Profile” to choose an output format you prefer. Click “Setting”. 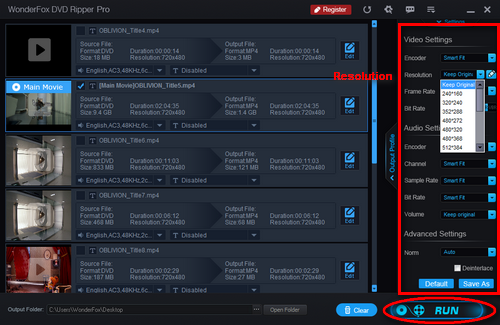 Then you can choose DVD movie resolution by yourself or just keep the original resolution. Then click “RUN” to start to rip your DVD. We don't recommend turning DVD to a higher resolution. In fact, there's no improvement in DVD video quality except that the files will become larger and the conversion speed will be slower. I’m sure you all know what is DVD resolution and if you are still struggling with DVD video resolution problems, I hope this article will help you. Of course, if you still have other questions, please contact us by email. This is a real No1. speed DVD ripper which can help you rip any protected DVDs to Digital with flawless 1:1 quality and within 10 minutes. It supports 200+ output formats and can also rip ISO image and DVD Folder.